A cross-party seminar, entitled “The EU and Western Sahara: trading fish, ignoring rights?” will be held in the European Parliament, Wednesday 7 December. The European Parliament will soon vote over an extension of the EU fisheries in occupied Western Sahara. A confidential evaluation from the European Commission reveals that the agreement is a complete waste of EU tax payers’ money and destroys the fish stocks. The Parliament’s legal services consider the agreement to be in violation of international law. 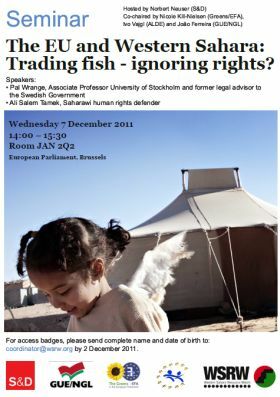 A cross-party seminar, entitled “The EU and Western Sahara: trading fish, ignoring rights?” will be held on this topic in the European Parliament, Wednesday 7 December, 14h – 15h30. Speakers are Pal Wrange, Associate Professor at Stockholm University and former legal counsel to the Swedish government. Also attending is Ali Salem Tamek, one of the best known Saharawi human rights activists who has spent years in Moroccan jails for his peaceful activism for the right to self-determination. In October 2009, he was arrested upon his return from a visit to the Saharawi refugee camps in Algeria, and referred to a military court charged with treason. He was temporarily released a couple of months ago. Find more info about him at Amnesty International and Human Rights Watch, among others. In addition, MEP Isabella Lövin will present her findings as the EP Development Committee's rapporteur on the EU-Morocco fisheries agreement. The event is organised in cooperation with Western Sahara Resource Watch.